and his cottage "Spring Glen (??)" It was so late when the last carriage rolled down the avenue, bearing away the last smiling little guest, that the children were almost too sleepy to undress. It was not long until the last light was put out in every room, and a deep stillness settled over the entire house. One by one the lights went out in every home in the valley, and only the stars were left shining, in the cold wintry sky. No, there was one lamp that still burned. It was in the little cottage where old Professor Heinrich sat bowed over his books. "Some people said that old Johann Heinrich never slept, for no matter what hour of the night one passed his lonely little house, a lamp was always burning. He was a queer old German naturalist, living by himself in a cottage adjoining the MacIntyre place. He had been a professor in a large university until he grew too old to keep his position. Why he should have chosen Lloydsborough Valley as the place to settle for the remainder of his life, no one could tell. ....Over in the cabin by the spring -house where the boys had left the tramp and Jonesy, a puff of smoke went curling around the roof. Then a tongue of flame shot up through the cedars, and another and another until the sky was red with an angry glare. It lighted up the eastern window-panes of the servants' cottage, but the inmates, tired from the unusual serving of the evening before, slept on. It shone full across the window of Virginia's room, but she was dreaming of being chased by bears, and only turned uneasily in her sleep. The old professor, on his way to the kitchen, noticed that it seemed strangely light outside. He shuffled to the door and looked out. "Ach Himmel!" he exclaimed, excitedly. "Somebody vill shust in his bed be burnt, if old Johann does not haste make!" The "cottage adjoining the McIntyre place" is most likely 100 Peace Lane, and may be the home noted on the 1930's map of Lloydsboro Valley as "Spring Glen." 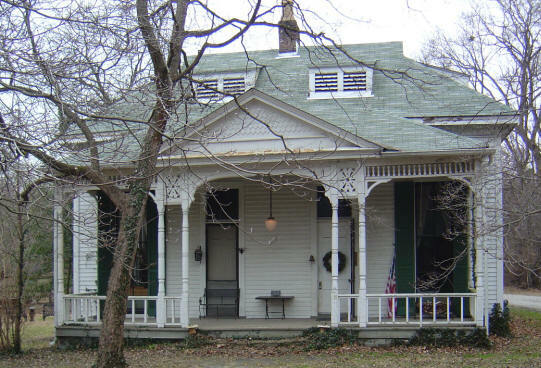 It once served as a guest cottage for a much grander home owned by I.Caldwell, which burned down long before the Little Colonel stories were written. The cottage was built so his daughter could receive gentlemen callers and they could properly spend the night. "The house at 100 Peace Lane has two outbuildings and two historic structures some of which date to the 1850s or 1860s and the no-longer-extant main house on the site. These include a board-and-batten sided carriage house, a partially below-ground spring house and an unusual stone retaining wall with a recessed arched area that appears to mark and protect a spring. The elaborately detailed Victorian Vernacular cottage dating from about 1880 which today is the principle building on the property is itself actually an outbuilding, having served as a guest house for the much larger residence (which burned down)." As for the identity of Johann Heinrich, there are several possibilities. Although Annie Fellows Johnston never met John James Audubon (he died in 1851), she may well have met Maria Dillingham Blakewell, a sister-in-law of the noted naturalist, who built The Gables in 1895. Annie includes a description of The Gables with its diamond-shaped window panes in the story. Further, The Gables was Annie Fellows Johnston's home for awhile before she moved into The Beeches. 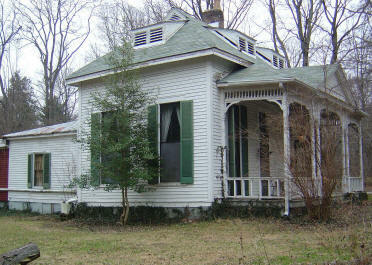 The Waltons (Lawtons) also lived there for a short time (in fiction as well as fact) while The Beeches was being built. Another possible model for Johann Heinrich may have been Noble Butler, who owned Tuliphurst, was a Harvard graduate, a University of Louisville professor, and according to local legend, helped give Pewee Valley its unusual name. BTW, before ending, the "Spring Glen" on the Lloydsboro Valley map could either be this old cottage at 100 Peace Lane OR the Genevieve and Alfred Chescheir House, built in 1923 at 120 Peace Lane. The map was created by the Pewees, who were concerned that their town be properly portrayed in the movie, and includes some lovely homes never associated with the books. 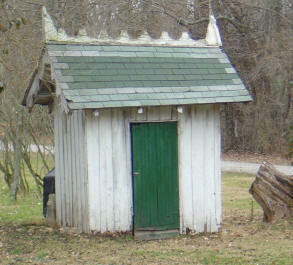 That said, this is definitely the cottage in Two Little Knights of Kentucky. The Chescheir house was built too late to be in any of the books.